Saturday, June 30, 2018 --- MAROON POETRY FESTIVAL presented by Smoke Signals Studio, Community Justice Project, and the Dream Defenders features renowned Poets SONIA SANCHEZ, NTOZAKE SHANGE, THE LAST POETS, artist EMORY DOUGLAS in conversation with American rapper, VIC MENSA, and Chicago based American Soul Singer, JAMILA WOODS at The Historic Belafonte TACOLCY Center. The TACOLCY Center was established in Liberty City in 1966 amid racial and economic tensions as a “safe space” for youth to express themselves. MAROON POETRY FESTIVAL follows in that tradition as a liberatory space founded on truth-telling and community building. A central theme of this inaugural festival is a direct action solution, through intersections of poetic expression, to address the escalating incidence of gun violence impacting communities across the nation. A 30 for 30 Social Media Campaign launched on June 1, 2018 to provide the historic cultural legacy and relevance of sovereign Maroon colonies, featured poets and artists, and Liberty City. Following MAROON POETRY FESTIVAL is The Backyard Jam at Smoke Signals Studio that will showcase local artists sharing their poetry, an open mic, portable bar with mixologist, live music and DJ set by RICH MEDINA and ARTHUR BAKER. 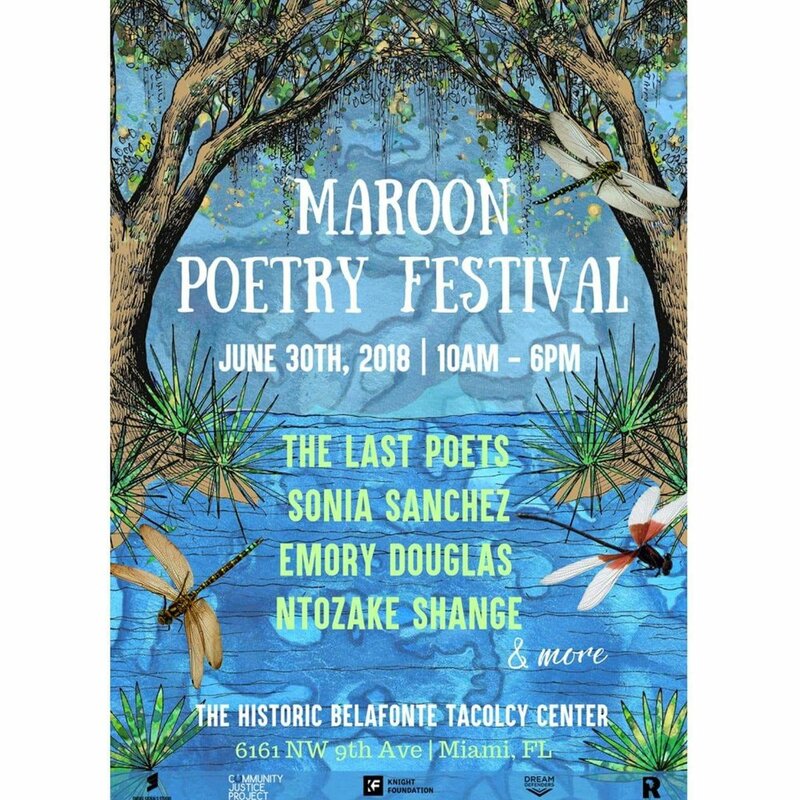 MAROON POETRY FESTIVAL is expected to attract more than 2000 constituents over the course of the day from diverse backgrounds to heal the community through artistic expression in South Florida. Established in 2012 in response to the unjust murder of 17-year old Trayvon Martin, DREAM DEFENDERS is a statewide grassroots organization based in communities across Florida. The Dream Defenders are diverse group of people who build power by organizing services, direct-action, and political-education programming for community civic engagement.